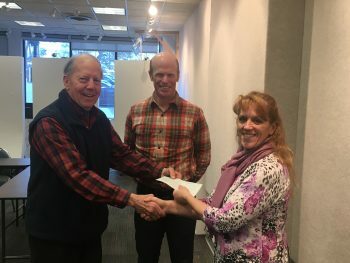 The Maine Chapter of the American Institute of Architects (AIA) recently provided a gift in excess of $10,000 to establish a special fund for the Bachelor of Architecture program at the University of Maine at Augusta. The funding will support a variety of activities within the Bachelor of Architecture program, including obtaining guest speakers, providing special programming, and defraying student conference costs. Additionally, the funds will support student scholarships and faculty initiatives. Pictured left to right: John Morris, Jesse Thompson, and Staci Warren. AIA Maine President Jesse Thompson and Treasurer John Morris presented the check to Staci Warren, UMA Director of Annual Giving & Alumni Relations. “This generous gift from AIA Maine will further our ability to teach architecture through engagement opportunities and empower students to explore the built environment in a variety of ways,” said Eric Stark, Architecture Program Coordinator and Associate Professor of Architecture. AIA Maine has previously supported the UMA Bachelor of Architecture program by establishing in 2012 an endowed scholarship, the AIA Maine Centenary Scholarship Fund, for students seeking to study architecture at UMA as part of AIA Maine’s 100-year anniversary. The Bachelor of Architecture program at UMA is the only five-year professional architecture degree program in Maine, and provides students with a path towards architectural licensure. The program faculty teach architecture through engagement, educating and empowering students to explore, investigate, and analyze the built environment. Engagement brings students into active contact with each other, their coursework, and community partners across Maine.